I love making pizza. Well, I love making all types of breads that involve yeast and working the dough. It’s very satisfying. 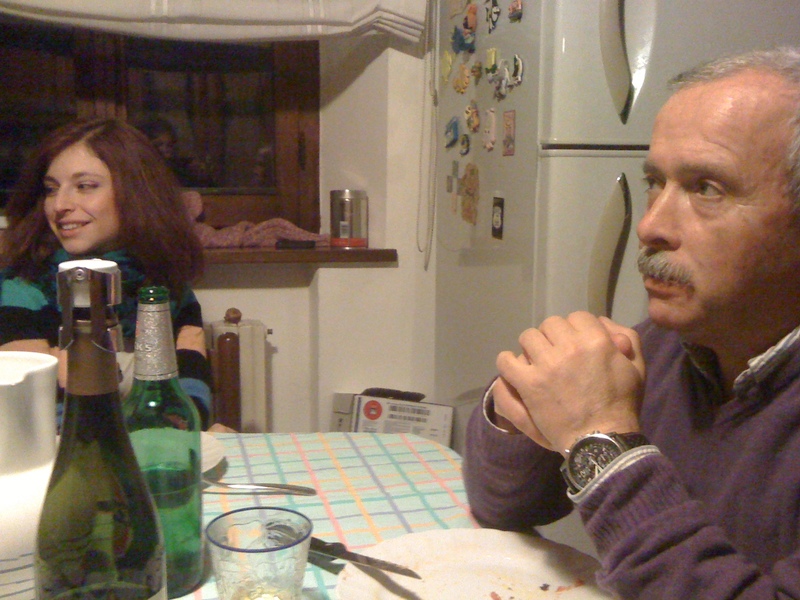 I’ve been to my friend Franca’s house many times for pizza and each time I eat it, I keep thinking it’s a recipe very similar to mine. So I asked for her recipe and as it turns out the ingredients are identical. My dough has a little bit more water and I do two risings instead of one, which I think makes it a little less dense, but essentially it’s the same. For those of you who are scared to work with yeast, don’t fear, this recipe is practically fool proof. There is no heating water or adding sugar. 250 grams water ( I use about two cups but we measured it exactly at Franca’s and she uses about 1 1/2 c.) The water should be room temperature, or tepid. I use a 16 oz bottle of spring water. 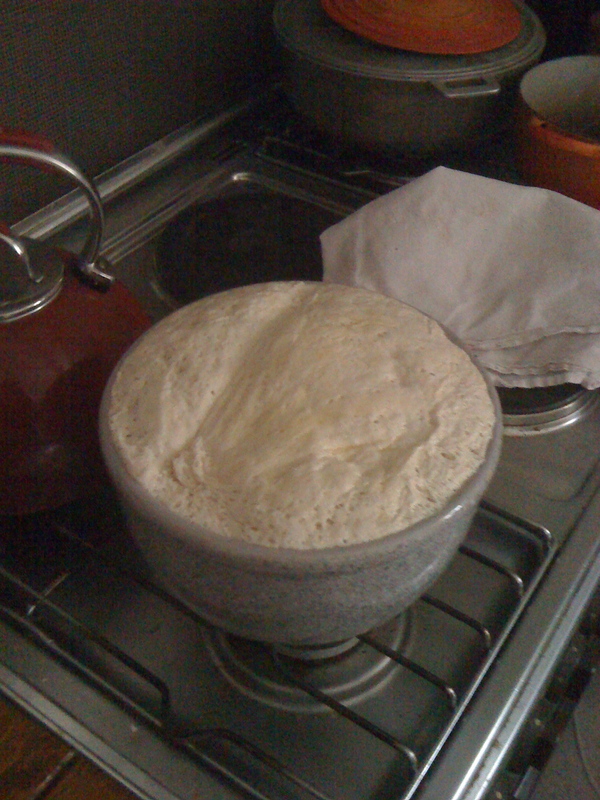 500 grams flour (About 4 or 5 cups — you’ll be able to tell when to stop when the dough starts coming together. Franca and I both use OO flour which is a high gluten flour. You can use a bread flour if you can’t find the OO but I regularly found it in the states. Salt – This is crucial for taste. Use at least a good tablespoon full. It seems like a lot but it’s really not. Franca makes her dough in her kitchen aid mixer. She is the only Italian I know who has one and I long for mine every time I am at her house. They are just way to expensive here to buy so I make mine the old fashioned way. By hand. Put your water in a bowl and dissolve the salt and the yeast cake. 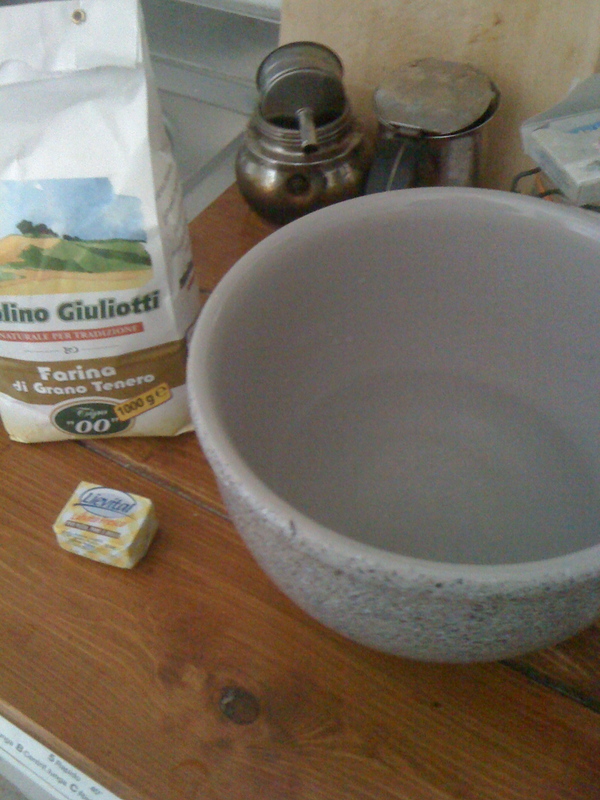 Start adding the flour a little at a time until the dough starts to form. Really, it’s that simple. If you are doing this in your mixer it’s the same idea, use your dough hook and when the mixture starts to pull away from the sides, scrape it out of the bowl. 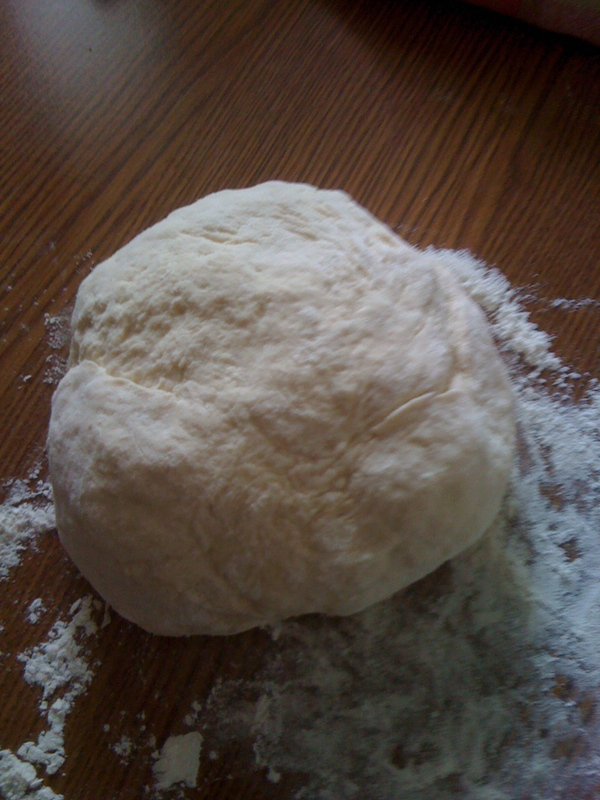 Move the dough to a floured board and continue adding your flour until you have a pliable, workable and elastic dough. It will take a few minutes of kneading. You don’t want the dough too dry so resist the urge to add too much flour. The next step is to let it rise. Put it in a clean bowl, you can oil it with a little good quality olive oil if you want. Cover with plastic wrap, and then let it rise in a warm draft free place. Franca does this slowly over the course of the day. My recipe calls for two risings so I let mine rise for two hours, deflate the dough, separate into two pizzas and let the dough balls rise again. This recipe will make one big pizza if you have a big pan like Franca does. Or you can do my method and separate into two medium size pizzas. This recipe is easily doubled. When I had dinner with Franca the other night, she had doubled this recipe and made one big pizza and one big focaccia, which is basically the pizza dough baked with olive oil and salt. 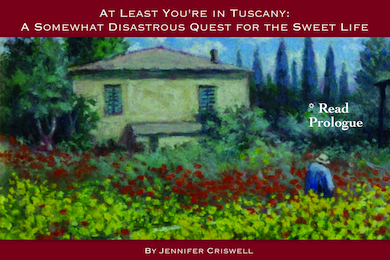 She serves it as a second course with prosciutto. Squisito! When your dough is ready, you just have to roll it out. Franca uses a rolling pin to do this, but I like to do it by hand and just spread the dough out. I think the rolling pin method makes the dough a little tough. If you do it by hand spread it out on a floured surface and then wait a few minutes to let it relax. It becomes much easier to work with than if you try to force it into submission all at once. You can then plop it right on a cookie sheet or put a piece of parchment under it. Add your toppings. Bake in a very hot oven. 250 c. (almost 500 degrees Fahrenheit or as hot as your oven will go!) for about 20 minutes. Put it on the lowest rack. That’s it. It’s really very simple to do and it’s something you can put together in five minutes in the morning and leave all day and then bake when you are ready. Toppings are up to your own creativity. 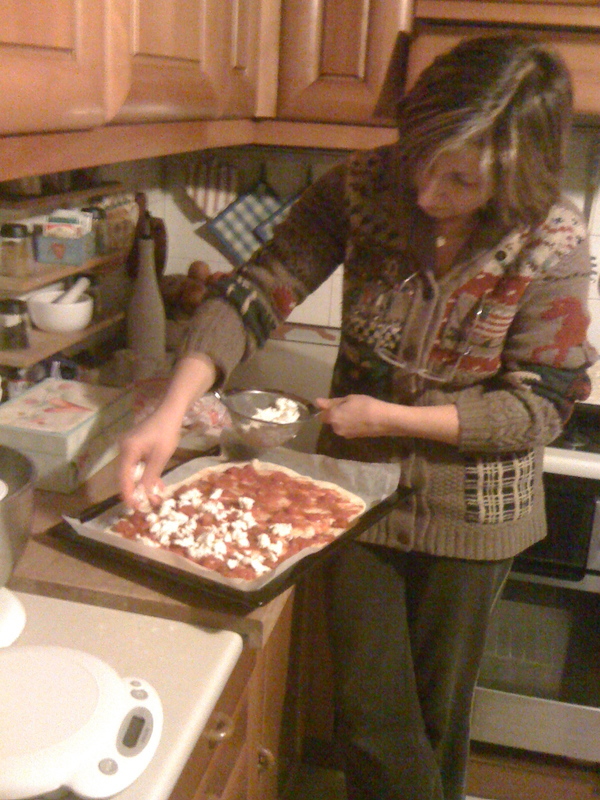 Franca puts a tomato passata, sprinkles salt and oregano and then mozzarella. 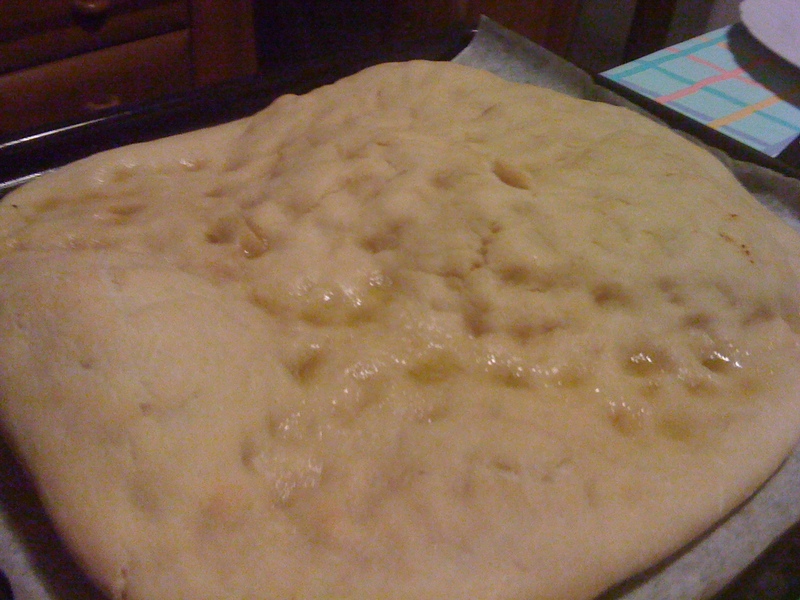 For the focaccia, she dimples the dough, rubs it with olive oil and then sprinkles salt. 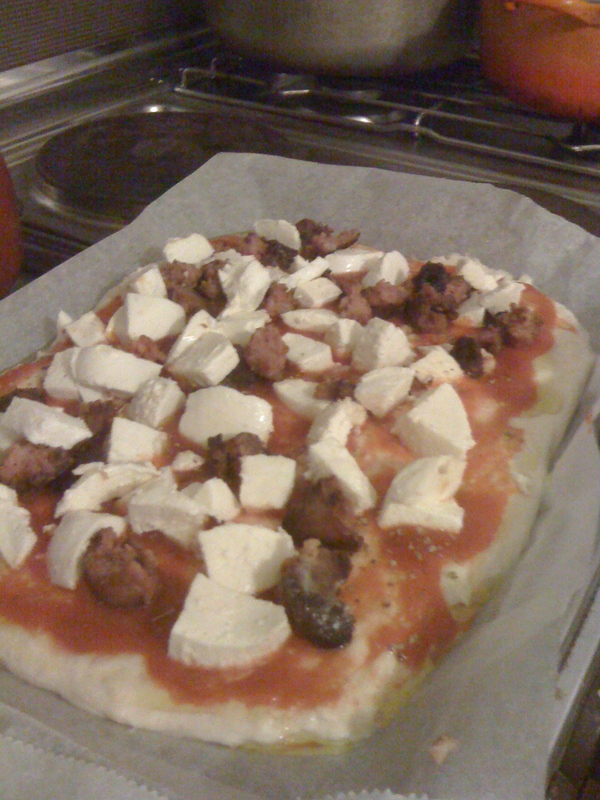 So you would have some idea of the steps, I made pizza yesterday and it was delicious. I used some tomato passata, salt, oregano, mozzarella and I had some leftover sausage so I crumbled that on top too. Prova! And let me know how you like the recipe. 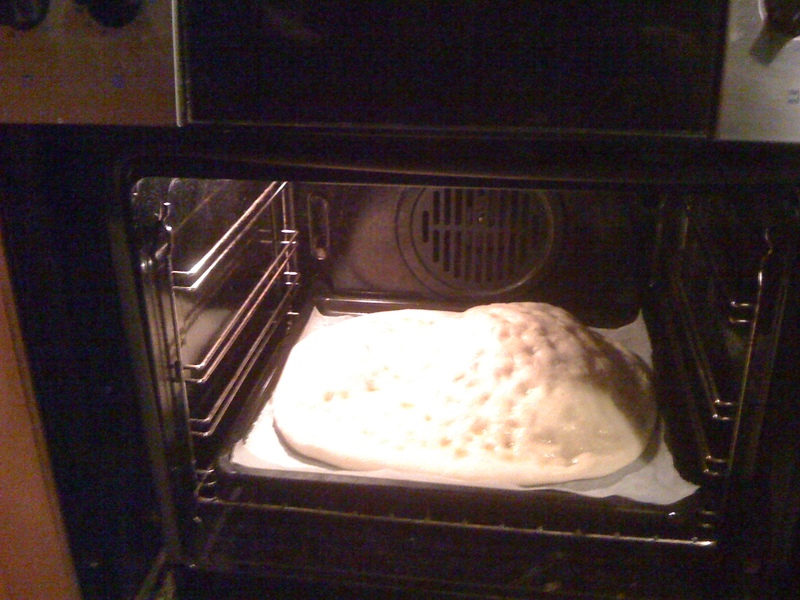 Franca's focaccia develops a gigantic air bubble which she deflates. 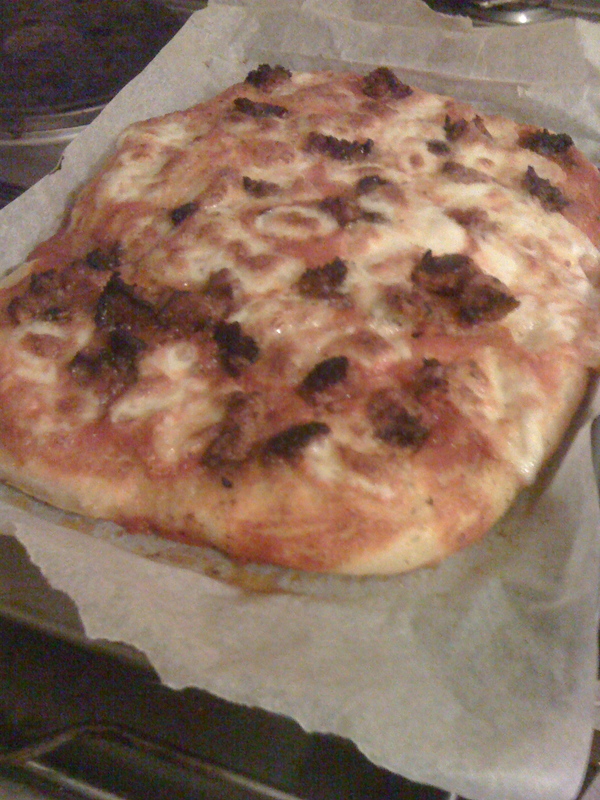 The finished sausage pizza hot out of the oven. YUMMY!